A clean bike is a happy bike! Keeping your bike clean is an essential part of bicycle maintenance ensuring better performance, increased safety, easier repairs, increased life of all parts of the bike, and more fun on your next ride! Pedro's Pro Brush Kit offers a set of four unique brushes designed specifically to easily and quickly clean all parts of the bike. Developed specifically for our grime-devouring chain cleaner, Pig Juice is an impressively effective and economical degreaser/cleaner that makes bicycle drivetrain cleaning quick, easy, and safe for anyone from novice to professional. 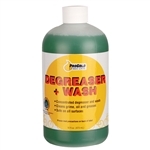 Degreaser 13 takes degreasing chemistry to new levels with performance that must be seen to be believed. Your drivetrain hasn't been this clean since the day you bought it! The Premium Bike Care Value pack include the best selling Multi Bike Degreaser, DRY Lube, and Super Bike Wash™. Everyone knows that a clean bike runs smoother and lasts longer and it has never been easier to achieve that. Finish Line Gear Floss is Perfect for cleaning your rear cassette, front chain rings, derailleur pulley wheels, hubs and spindles, brake arms, bottom bracket/crank interface, and more. Makes 4 liters. Will quickly clean dirt, clay, road grime and chain soils off your bike with little to no scrubbing. Five different cleaning agents work together to create a high speed cleaning system. Grease Monkey Wipes are multi-purpose cleaning wipes that use an all natural, citrus formula for heavy duty cleaning. Each wipe easily removes grease, grime, oil, marker without using harsh chemicals. Ideal to stick in toolboxes, saddle bags, emergency repair kits, backpacks. Super Bike Wash will quickly clean dirt, clay, road grime and chain soils off your bike with little to no scrubbing. Five different cleaning agents work together to create a high speed cleaning system. ProGolds Bike Shine restores your bicycle to that like-new shine. Bike Shine also protects against the sun rays that can dull and fade your bike frame over time. Safe for all surfaces on your bicycle. BikeShine also leaves a residual coating that aids in repelling dust and dirt. Bring out the shine of your bicycle with Bike Shine! Concentrated formula gently cleans off grime, oil, greases and dirt. Safe to use on all surfaces. ProGold Bike Wash is safe for CARBON FRAMES and contains no lye, phosphates, bleach, dyes, brighteners, or cheap perfume. Certified biodegradable, non-toxic and safe for the environment. Phil Wood Hand Cleaner meant to be used on dry hands, worked in, then rinsed off. Just a small amount will remove stubborn grease, oil, and dirt. Used by bicycle and automotive mechanics, it is effective and clean smelling. No animals were used for testing and no animal products are used in production of our hand cleaner. Comes in a 16 oz. tub with resealable lid.